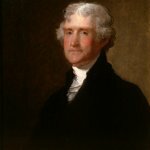 April 13 is Thomas Jefferson's Birthday, the third President of the USA. He is considered as an American Founding Father and the author of the Declaration of Independence. Thomas Jefferson was born on April 13, 1743. He had a prominent career as a politician. He was a spokesman for democracy, he represented Virginia in the Continental Congress, embraced the position of Governor of Virginia, served as the U.S. Minister to France and the United States Secretary of State. One of the major Jefferson's achievement was signing of the Declaration of Independence, that proclaimed all 13 Britain colonies to be independent sovereign states, no longer governed by the British Empire. Thomas Jefferson was a well-educated person and depended on books. He sold more than 6,000 books from his own library to the Library of Congress after it had been burned by the British 1814. Also 74 volumes of Jefferson's library were discovered at Washington University in St. Louis. Although Thomas Jefferson is known as an outstanding politician, he was also an inventor, agriculturist, paleontologist, archaeologist, writer and a collector.